While your ‘A’ race may still be far off into the future, the first races of this season are just around the corner and it’s time to dust off your chamois and put your game face on. The first race(s) of the year can be a shock to the system or a great step towards a solid season. Start your 2014 season strong and you’ll have momentum to carry through the year. Even if you have been performing field tests throughout the winter, it is difficult to simulate true competition. No matter how many races you’ve done, the nerves of race morning, the routine of getting body marked or pinning on your number, the elevated heart rate and butterflies in your stomach are all parts of race day that can’t be simulated. Your first race is where you remember what those feelings are like and how you deal with them. That doesn’t mean that this race is a throw away race without meaning. It is important to view this race as a yardstick by which to measure your progress towards your seasons goals and ultimately your ‘A’ priority race. However, using the five tips outlined below you can set yourself up for success as you head into the great unknown. Relive your past successes in your minds eye as you lay down to fall asleep each night. Think about races that were particularly hard and required you to dig down deep in order to push through. Visualize yourself having the race of a lifetime. See yourself having strong swim and a smooth transition or making the break and crossing the finish line with your hands raised high. It is also beneficial to imagine small mishaps occurring during the race and to see yourself respond to them calmly with a clear head. What would happen if you got kicked during the swim? How about if you dropped your chain? Obviously being physically ready is the most important element, but it can also be the most tricky. Athletes in the northern hemisphere have endured a harsh winter and have likely spent a lot of time indoors this winter. Training on the open road has been limited and an open water swim is out of the question. Hopefully the weather breaks and your chances to get outside increase. Several weeks before your race spend at least one session mimicking the demands of the race. For runners that may mean finding hills or using headwinds to mimic hills. Cyclists will want to do group rides to get used to riding in a peloton and responding to attacks. Triathletes should use a pull buoy to simulate swimming in open water, doing various sighting drills. A few weeks before the race pull all of your lonely race equipment out of the closet to check that it is still in working order. Make sure there are not any gaping holes in your wetsuit and the zipper still works and that your bike is shifting properly. Mount some tires onto your new race wheels that you received for Christmas and take them out for a spin to ensure nothing is rubbing and they are as fast as they look. 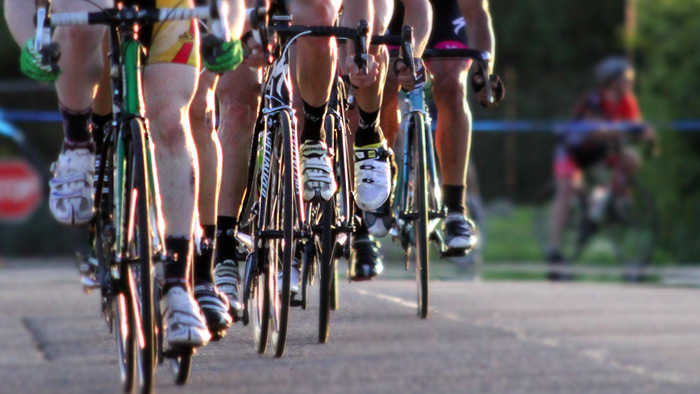 If you are thinking about getting a tune up try to do this several weeks before the race so you have an opportunity to ride your bike several times to identify and take care of any issues that may arise. Lastly, wash your bike to shave off a few extra seconds… everybody knows a clean bike is a fast bike! Print out one of these handy race day checklists (triathlon or cycling) to make sure you have all of your gear. The night before the race Lay out all of your race gear and pack your bags as you give it a final once over. Most athletes have a pre-race breakfast that is tried and true; stick with what you know! Not only is your body accustomed to this meal but the familiarity can bring peace of mind and calm the race day nerves. Fueling during the race can be the difference between a top finish and a DNF. If you already have your routine locked down then stick with what works. However, if you are still looking for that perfect mix then an early season race is a great place to put what has been working in training to the test. If you found yourself knocking on the door to bonktown in more than one race last season then use this race as an opportunity to try that new product you have been eyeing. If you found dehydration to be an issue in the past try commit to working on your hydration strategy. You want to do well, but truth be told, you are entering into the unknown. What happens today can set the tone for the rest of your season. It is important to go into the race with realistic expectations and rather than setting outcome goals such as first place or top 10 try setting process goals such as negative splitting the run, focusing on different aspects of your swim stroke, or focusing on your cadence or pedal stroke. It is also important to resist getting too caught up in ‘the numbers’. Today you are a different athlete then you were 3 or 4 months ago and the paces and power you became accustomed to looking at may not apply anymore. Try putting a piece of tape over your device and racing by feel as you listen to your body rather than the numbers on your device… you might just surprise yourself by setting a new pr or redefining what is possible. Luck favors the prepared. By taking steps to come into your first race ready and prepared you will be setting yourself up for success. Not only will you get a good snapshot of your current fitness upon which to build, but you might just find a gear you weren’t aware you possessed setting you up for your best season yet! Dave Schell is the Director of Education at TrainingPeaks and a USAC level 2 certified cycling coach. He coaches triathletes and cyclists of all levels from beginner to pro to achieve their highest potential. When Dave isn't traveling the world teaching others how to better use TrainingPeaks, he's trying hard not to fall off of his mountain bike.